Book Seven - "Book 7-01"
New chapter hype! Looks like Mark finally got changed back. Also, Luna is super adorable. It explains all that in the comic. Also, good job on the umbrella! I’m amazed at the detail. Mark is definitely being set up to become ‘daddy’ to the alicorns, isn’t he? 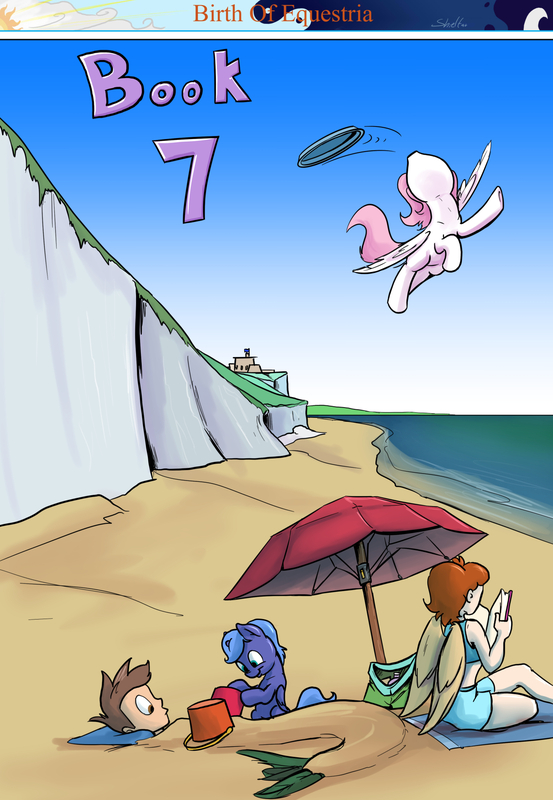 BTW Shieltar, if you ever feel like setting up a Kickstarter to get this Birth Of Equestria published as a print comicbook…I’d fund the heck out of it. Hmmm. I will think about it. the 1st book would be the hardest to do as there is a lot of work in it. for example, it contains the only uncoloured pages, the most spelling errors, and most of the pages are non standard sizes. So a lot of work to get it print ready. Which if that was the only consideration, I would be fine with doing. At what point does copyright ownership of characters stop? and have I differentiated enough from the shows design that the inclusion of Tia, Luna, and other show relevant plot points is not a problem? Would I have to get permission from Hasbro? This is why I monatize as the artist and not the comic directly. Ohh, oh crud, yeah. Using a pre-existing character would almost certainly infringe on Hasbro’s copyrights, unless you could prove that your versions of said characters (namely Tia, Lulu, and l’il baby Discord) are substantially different from their forms in Hasbro’s copyrighted materials. Which you probably couldn’t, as they would have heavy legal backing and you wouldn’t. Still, it would be lovely to see this in hardcopy – and perhaps there may still be some loopholes, such as you receiving money from fans for your artistic skill, and giving away book copies as a *free* thank you gift. The money isn’t for the book, so you’re not making any profit of someone else’s copyrighted property…it’s a grey area though, I dunno law that well. Sadly due to said copyright concerns, BOE will not be issued as a hardback, unless someone who’s an actual RL lawyer can tell me if the differences I’ve made are sufficient. I think even a RL lawyer would start by saying first contact Hasbro about this. Of course, they’d probably do this on behalf for you. Hooray for one letter per line responses! Princess with here head tilled sidways, one eye half lidded in confusion staring straight ahead: Mummy? Yes sweetie…head held same manner. I believe they are crowding the margins…..
Grins and eyes and hands can be seen out of a thin window from floor to sky. Luna! Cries one words coming out in a Matrix style. Yesh….says Mark. Reminds me of when I fed my aquarium. Wait, is ‘Tis throwing that frisbee to herself while flying? There doesn’t seem to be anyone else who could have thrown it. I’m impressed with her coordination.